What You Will Learn: This post shares how 501c3 nonprofits can get started with the Google Ad Grant and what key ad grant stipulations your organization needs to be aware of when managing your $10,000/month Google grant. Google has an amazing program where registered 501(c)(3)s can receive $10,000 dollars in advertising spend a month for free. That’s right, registered nonprofits have the ability to get $10,000 of free advertising a month. If you’re unfamiliar with online marketing, Google AdWords serves ads to people as they search on the internet. Whenever you type a search query on Google and see an ad that’s similar to what you’ve searched then you’ve seen Google AdWords in action. You may be asking yourself why don’t the majority of nonprofits utilize the Google Ad Grants program? The simple answer is that they haven’t heard of this program, or if they have, they aren’t sure how to take advantage of it. The program requires additional resources and knowledge to setup and run campaigns. What most people don’t realize is that Google provides a series of free lessons to help you learn how to use their Google AdWords platform. Once an individual completes these lessons they can then take a test where they can receive their certification. Google AdWords works by finding keywords that trigger your ad. When a user types in a search query it triggers ads that are relevant to what the individual typed in. Let’s say that we wanted to run an ad for anyone looking for the Google Ad Grants Program. To do this we need to find all variations of what people call the Google Ad Grants Program. If we choose the keyword “Google Ad Grants” then anytime someone types this in it will trigger our ad. Each term we bid on has a certain cost per click (CPC). Google will only let you pay $2 for a click. If a cost per click is more than $2 then we’re out of luck and will need to find another keyword. The cost for a keyword ranges from a few cents to hundreds of dollars. There are a number factors that go into this, but essentially, it depends on what people are willing to pay for a keyword. If people are willing to pay $10 for a keyword, then the price will be $10. It’s what we call market based price. You may be asking why Google only lets you show ads on the Search Network. Google hasn’t given a reason for this, but for the time being it’s all that is allowed for the Ad Grants Program. Google allows you to advertise on other sites that have partnered with Google. This allows your ads to reach more people searching the web. These partners include AOL, Comcast, Amazon & more. Since Google gives registered nonprofits $10,000 in free ad spending a month out of generosity, they aren’t allowed to show these advertisements on their Search Partners. How Many Monthly Site Visitors Has Community Boost Generated from Ad Grants PRO? These requirements are not difficult to achieve if you know what you’re doing, but can seem difficult if you don’t have any experience with Google AdWords. As of about two weeks ago, Google has taken down their Grants Pro application page and are no longer accepting applications. This is not the first time that Google has done this. It happened two years ago and it took them over a year to bring back the Grants Pro program. For more information about this take a look at our blog post called (Link to Grants Pro Blog Here). 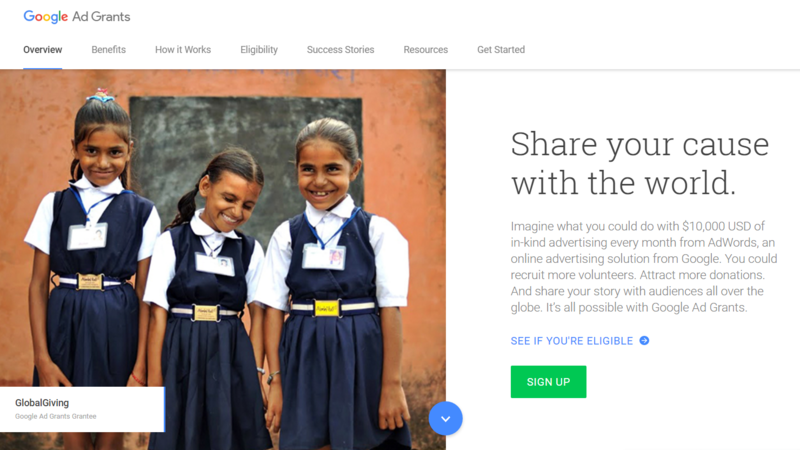 Google has created the Ad Grants Program that gives registered nonprofits $10,000 of free advertising every month. To get this money you just have to fill out a short 500 word essay on why your organization needs the funds. From there, all you need to do is build out the campaigns in AdWords. The Google Ad Grants Program translates into more awareness for your organization and cause, increased email list size, increased number of volunteers and increased donations. In fact, the Ad Grants program is highly customizable and can be used to increase all of your organization’s goals. We’ve worked with many nonprofits receiving Google Ad Grants. We’ve seen $10,000 translate into 5,000 website visitors a month. This has resulted in increased online donations, more program inquiries, speaking engagements, volunteer applications, and more! Increased donations can be one the most valuable aspects of the Ad Grants program. We helped a nonprofit increase their online donations by 5 times (from $17,744 to $95,341) with individual donors growing from 233 people, to 1,422. This all happened in only one year! Whether you’re a multimillion-dollar nonprofit or a nonprofit that started yesterday, your organization can benefit from the Google Ad Grants Program. Google has made it very easy for nonprofits to apply for these programs. Some organizations are restricted and cannot apply, including governmental entities, hospitals, schools, and childcare centers. Make sure your organization doesn’t fall into one of these categories here (https://www.google.com/grants/eligibility/). All you need to do is fill out an application. To get started you need to have your Employer ID (EIN). Every registered nonprofit is give a unique EIN. Once you fill in your EIN you’ll then be instructed to build out an AdWords campaign. You don’t need to build out a full campaign, but rather you need at least one enabled campaign, ad group, keyword and ad. If you haven’t applied yet, get our step by step video on how to apply for the Google Ad Grant now. If you’ve already been approved, there’s still a bit of work to do to stay approved. For example, you have to make sure your ads all link to the same web domain, the one in your initial application. You also have to actively engage with your Adwords account by logging in at least once a month, and making some sort of change each 90 days. Google wants to make sure you’re getting the best out of your grant, and making edits as needed! Also, you cannot do any commercial advertising. See the full list here (https://www.google.com/grants/eligibility/) to make sure you’re abiding by their rules so you can stay qualified! Plus, find practical steps on how to keep your Google Ad Grant active and above a 5% click-thru rate (CTR) on the Community Boost blog. If you have any questions about how to apply or unlock the Google Ad Grant, please don’t hesitate to reach out to us. In addition, if your nonprofit is interested in working with Community Boost to fully leverage Google Grants to scale volunteers and donors, then please apply to work with us today. Unfortunately your Free Application Guide link is not active. Hey Tatyana, that should be fixed now. Email us at info@communityboost.org if you need any specific information. I’m new to our marketing team. We had a google grant last year but I’m unsure if it’s expired or how to access it. Can someone guide me in the right direction to get this grant rocking & rolling? Thanks! Hey Julie! Someone from our team will be in touch with you shortly to get this figured out.